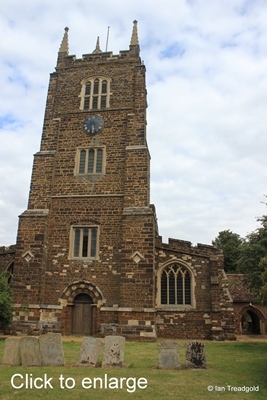 The church of St Edmund or St James in Blunham is in the centre of the village to the south-east of the main road through the village. 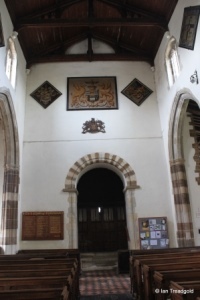 The church has a nave, chancel, north and south aisles, both with chapels, a west tower and north and south porches. 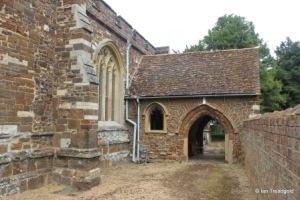 The church is of sandstone with parts dating from around 1100. 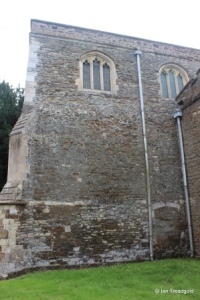 The lower part of the tower is the primary remaining evidence of a the church of that time which consisted of a nave, chancel and a north chapel along with the tower. 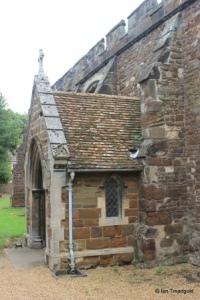 During C13 the chancel was rebuilt and the present chapels added in C15. 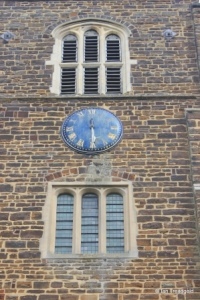 The tower was restored and the upper levels rebuilt in C16. 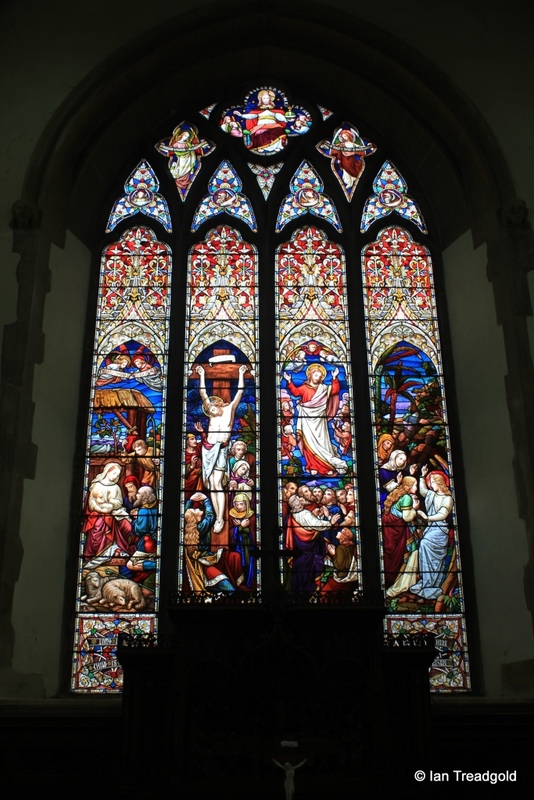 The south aisle has two south facing windows either side of the porch along with a west window. 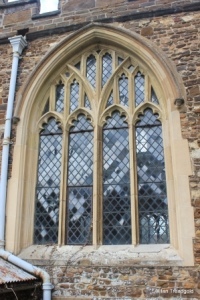 All three of these modern windows are of the same design being four-light trefoiled design with three quatrefoils in the head set in a four-centred arch. 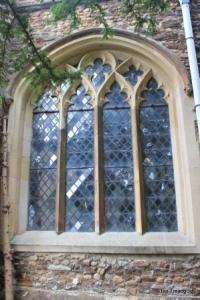 The south chapel has a modern south window of four-lights with a cinquefoil design with perpendicular tracery above in a two-centred arch dating from C15 although heavily restored. 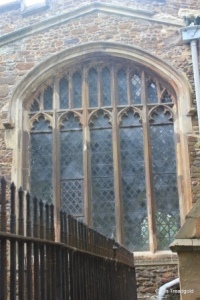 The east window of the south chapel is a five-light cinquefoiled window under perpendicular tracery under a four-centred arch also dating from C15. 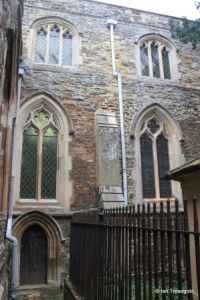 The south porch itself is of interesting design partly due to the proximity of the churchyard boundary. 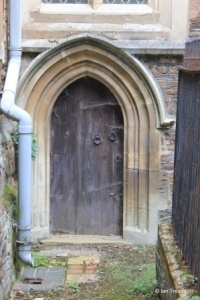 It is of two storeys although the upper room must be tiny. 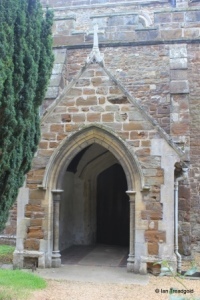 The porch entrances are to the east and west and none to the south itself. Presumably this would have helped with church processions with access to the south being non-existent. The roof is steeply pitched and modern. 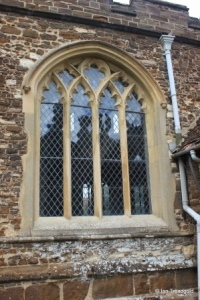 To the west side of the porch is a modern unglazed single light cinquefoiled window under a two-centred head. 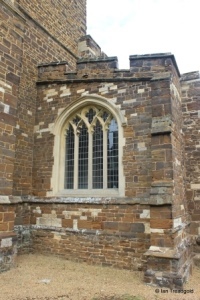 The lower portions of the west tower including the arches inside and outside date from the early C12. 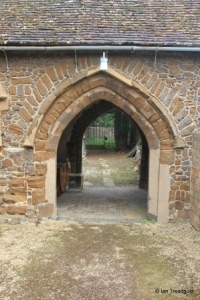 The arches have voussoirs (or alternating wedge shaped pieces) of oolite, a form of sandstone and ironstone both inside and out. The higher levels of the tower were rebuilt in 1583. 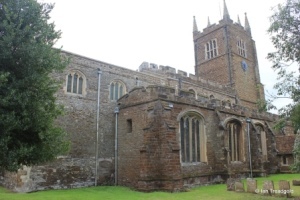 The tower is of three levels with unusual clasping buttresses on the west corners. The lower level has a modern three-light window under a square head with signs of a relieving arch above on the west side. 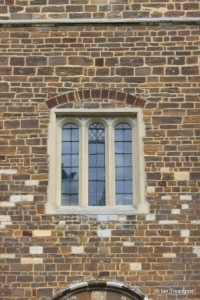 The middle level has a similar window whilst the upper belfry has three-light windows on each side under a four-centred arch. The parapet is embattled and adorned with eight pinnacles, the central pinnacles on each side being smaller. 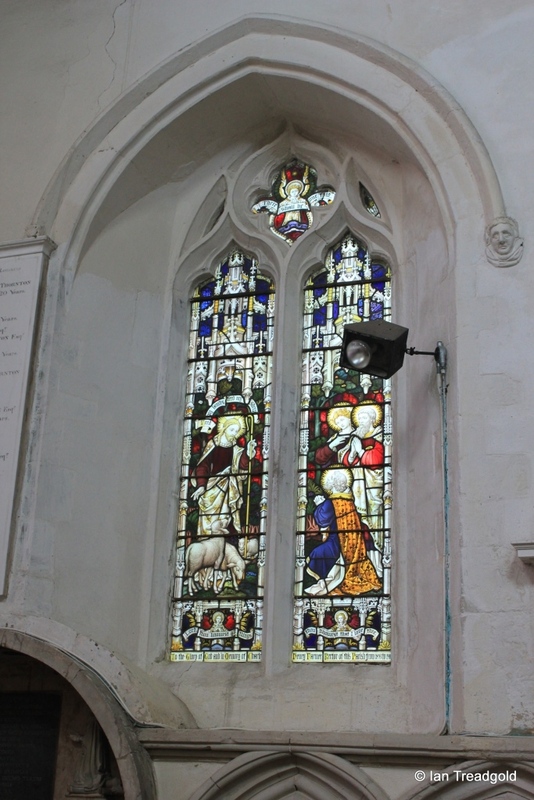 The north aisle west window is of C15 and has four cinquefoiled lights under a two-centred arch with perpendicular tracery. 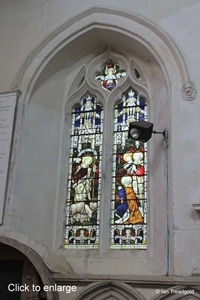 The three north facing windows of the aisle and north chapel are of a similar style - four cinquefoiled lights under four-centred arches. 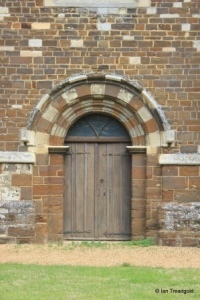 The north porch is an outer two-centred arch with the north door in a four-centred moulded head and label. 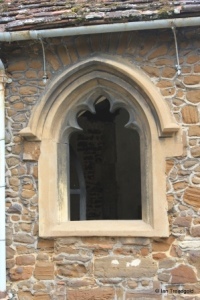 The porch has two small single light windows to east and west and a small gable cross. 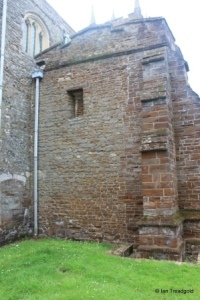 The east wall of the north chapel has a small blocked square window high up and there is blocked doorway on the north side of the chancel. 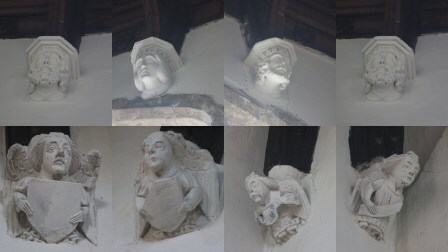 The clerestory windows above, three in the nave and three matching above the chancel are all three-light trefoiled windows under four-centred heads, all modern. 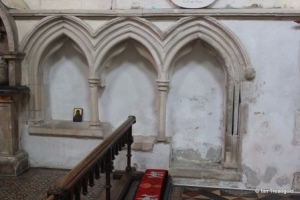 The nave and aisles have an embattled parapet. 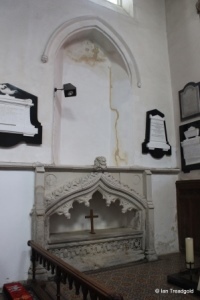 The north side of the chancel is windowless (apart from the clerestory) but does have a blocked window to the east end of the chancel below which is a intricately carved recessed tomb under a canopy. 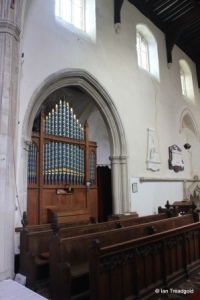 There is a two-centred arch leading to the north chapel which is now used to house the organ. 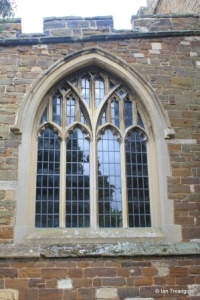 The east window is of four trefoiled lights under a two-centred arch with quatrefoil tracery in the head. 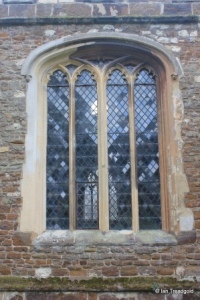 The south side of the chancel has two modern two-light trefoiled windows with quatrefoil tracery. 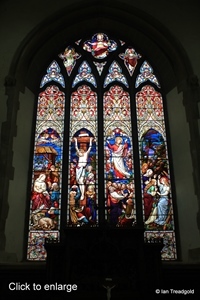 The western most window is tight above the small priest's door. 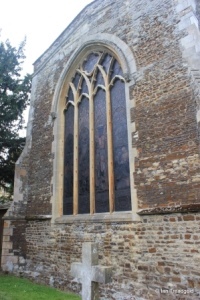 Under the eastern most of these windows is a stepped three seat sedila and next to this is the tomb of Susan, wife to Charles Earl of Kent who died in 1620. 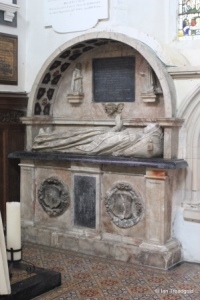 The alabaster effigy adorning the tomb is under a semi-circular arch. 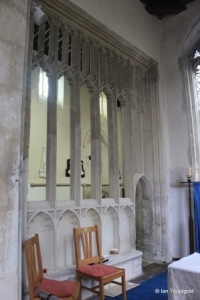 Between the south chapel and the nave is a stone screen dating from the late C15. 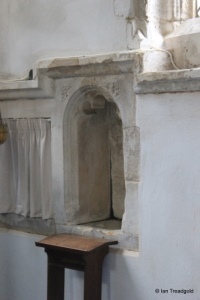 On the south wall of the chapel is a piscina. Supporting the roof beams are various carved corbels, a selection is shown below. Page last changed 04/09/2014. Reformatted 27/11/2015.